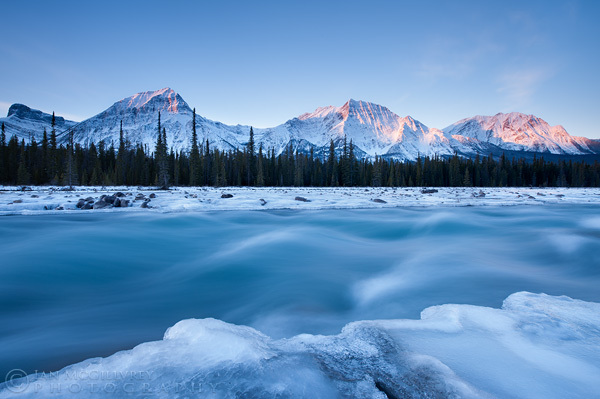 This week’s photo of the week is the first of my images from a trip up to Jasper last week with my good friend Wayne Simpson. We ended up spending most of our time shooting at various places along the Athabasca River along the Icefields Parkway. The views of the peaks along this stretch are particularly impressive and the rushing river combined with the ice formations on the shore provided plenty of potential for images. This image was taken on the very last morning of the trip and after 4 overcast days, we were pumped to see a clear sky and some sunlight for a change! This shot was taken with my Nikon 14-24 lens with a Lee 2 stop hard edge grad filter and a 3 stop solid ND filter. Using the solid ND filter allowed me to get a 6 second exposure which smoothed out the water as you see it here. Because I was so close to the foreground ice and achieving enough depth of field to render the entire scene in sharp focus was nearly impossible, I blended two exposures together after focusing on the foreground and background separately. I have lots more to share from the trip so stay tuned over the next few days to see more. Thanks for stopping in and having a look, I hope you enjoy this one.